Have you ever lost confidence in your 3-wood, and been forced to hit driver as a result? Wouldn’t you like to have confidence with both your 3-wood AND driver? Here are some of my best tips on finding a 3-wood that actually works! From the fairway or from the tee? – If you often pull your 3-wood from the fairway, it is crucial to find a head shape that will complement this style of play. Personally, I go for a lot of par 5’s with my 3-wood, therefore, I have a shallow faced club-head. What do I mean by shallow faced? Check out this quick sketch that I did, which illustrates my point. A shallow faced 3-wood is going to be much easier to get in the air from the fairway, but is generally a bit harder to hit off the tee. A deeper faced 3-wood will likely fly far off the tee, but be tough off of tight lies like the fairway. 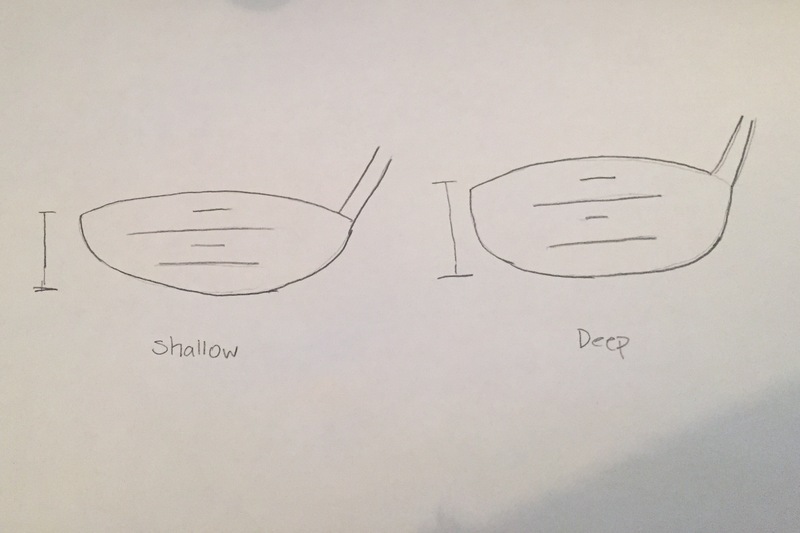 I have tried both, and considering I play courses with closely mown fairways, the shallow face is my best option. I have tried hitting a deep faced 3-wood (Adams Super LS) off the fairway, and noticed that it was difficult to get off the ground, and when I did get it off the ground, I couldn’t shape my shots like I wanted to. Everyone has their preference, but my vote goes to a shallower face like a Ping i15, or even a Titleist 913 low spin model. They give me good distance without sacrificing versatility. Loft – I have always played 15 degrees of loft with the 3-wood. I don’t want to say it’s the “standard,” but many tour players choose the same. Just like the driver, there isn’t really a surefire answer to this. Just realize that a 13.5 degree wood will be more difficult to hit off the fairway, and a 16 degree 3-wood will likely sacrifice distance off the tee. Shaft – Most of the time, you’d be fairly safe to put the same shaft in your 3-wood that you have in your driver. This is largely the reason why I think it is important to find a driver before a 3-wood. I tried to keep this post fairly short and to the point, because finding a 3-wood is a similar process to finding a driver, which I have already written about here. Trusting your 3-wood is huge when you have to get the ball in play. If you’ve tried everything, and just can’t seem to find something that works, I would like to suggest an alternative. With the hybrid era in full force, there are plenty of viable options that could replace a 3-wood altogether! What about playing with a 16 degree hybrid? Sure, you might lose 10 yards compared to a 15 degree 3-wood, but if it allows you to get the ball in play, go for it! Despite the common belief that we should all have a 3-wood, I don’t see any rule that requires one. I think that many players have a 3-wood in the bag only because of this inherent “rule.” Swallow your pride, and try something different for once! It might just drop some strokes off your score.